Crested Butte, Colorado, is located in a beautiful, remote area in the western part of the state approximately 30 miles north of Gunnison. The town is surrounded by beautiful, towering mountains and is. perhaps, best known for it's great winter skiing. 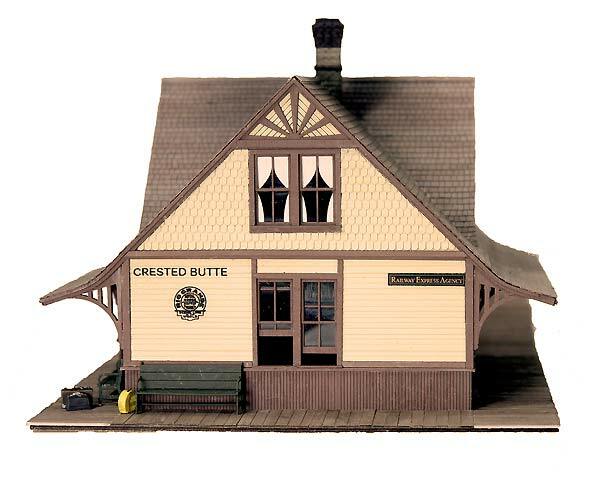 As modelers, however, we're more concerned with the history of Crested Butte, and, in particular, its role in narrow gauge railroading. The D&RG reached the town in 1881 and built the depot on the eastern side. Used nearly entirely for coal hauling, the branch remained in operation until 1955 -- perhaps a record for narrow gauge longevity? The structure still stands today and, in fact, the town has completed a multi-year restoration project. We owe them a very big THANK YOU! 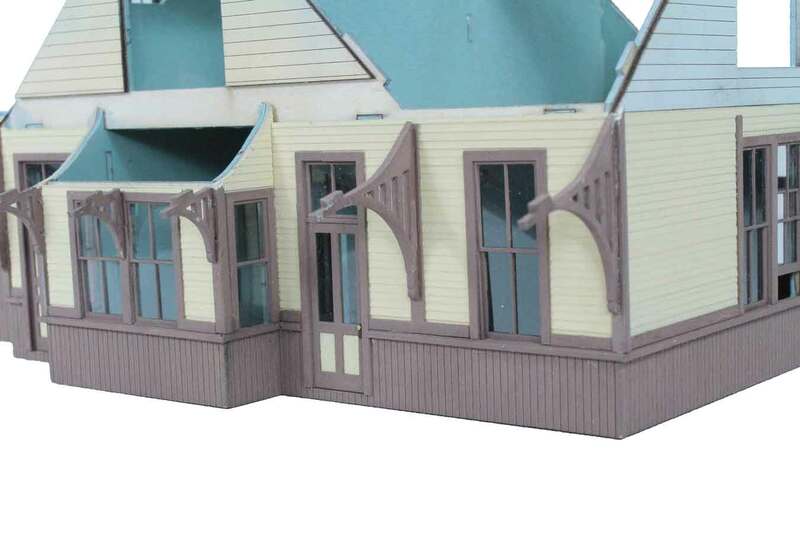 The structure is one of the smallest 2-story depots that I know of in Colorado, making it very attractive to both D&RGW modelers and others with limited space. The HO-scale footprint including the full platform only measures 5 5/8 x 11 1/2-inches (15 x 29 cm). The first floor includes a waiting room, ticket office, express room, freight room, and kitchen. The second floor includes two bedrooms for the station agent's family. The raised freight platform varied considerably over the years (not unusual!) and is somewhat scaled down from the original, making it more adaptable. Window treatments also varied over the years, but the kit includes the curtains for the living and waiting room areas if you choose to install them. More than 8 sheets are included of our premium, peel-and-stick textured shingles (correct prototype thickness!) making the model appear very realistic. The kit includes all the little details you've come to expect from us. The chimney casting is made just for this kit and replicates the original exactly. The prototype's trim is one of the most involved that I've ever tackled in a kit and, for the first time, includes the horizontal board trim (pre-cut, peel-and-stick) above the beltrail. The eave trim is built up from two layers of pre-cut, peel-and stick plywood. THREE sets of passageway doors are included so you can choose the one you like best or the one that best fits your era. I chose to use the doors with the glass panels -- another unusual feature of this depot. Naturally, door knobs and lockplates are included, as well as thresholds and window sills. The two station benches you see above are also in the kit, as well as the herald and signs. The freight room doors can be mounted in an open position exposing the scribed interior floor (freight not included) and you might also have noticed the open windows -- yet another option you have. Also note the beautiful "half round" or "fish scale" shake shingles used on the end of the second story wall -- quite unique and distinctive, designed just for this kit! Kit construction is typical of our design approach. A well supported interior plywood (no cardboard or laser board used) core makes extensive use of slots and tabs for correct assembly and supports the outer wall and roof details. Interior partitions (as well as a second floor) not only serve to support the outer walls (no additional interior bracing is needed) but also serve as view blocks, making the stucture appear more prototypic rather than as an empty shell. The interior partitions on the first floor include door openings that mimic the prototype's original floorplan. Note the support for the chimney -- just another detail we've include to make construction a little easier. 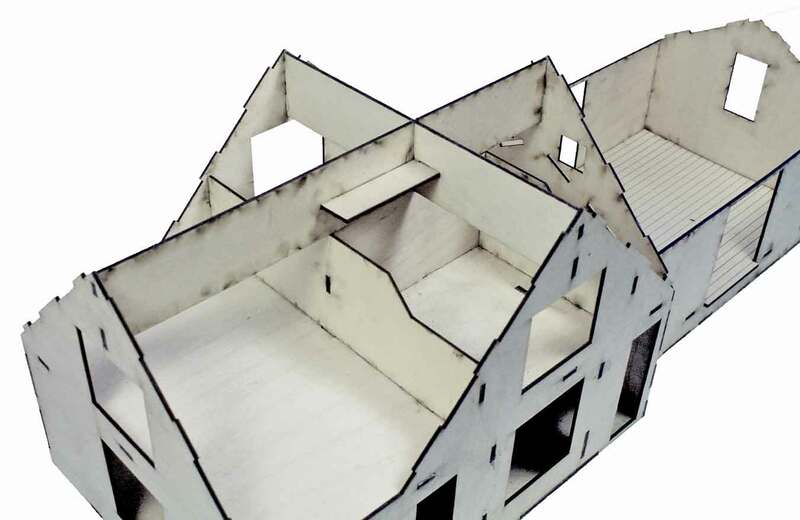 For structural reasons, the roof is not removable once the model is completed. The outer siding consists of peel-and stick "aged" clapboard (thank you, Northeastern Scale Lumber!) and etched plywood wainscoting. The platform roof support brackets fit snugly into slots in the walls for extra strength. The building is surrounded with both a belt rail and a horizontal trim rail, as is the prototype. Naturally, the kit includes a very well illustrated, large print, spiral bound (lays FLAT!) instruction manual that helps guide you through every step of the construction. It includes a section on helpful tools plus detailed recommendations on what products to use and how to apply the various finishes. Many assembly tips are included that may even improve your overall kit-building skills. And, yes, we also include one of our glue syringes to help assure a neat appearing final model.